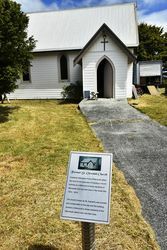 The former St Oswald`s Anglican Church commemorates those from the Marrawah District who died in service or were killed in action in World War One. Note : This former church is now a private residence. Rev. H. C. Cuthbertson. Rector. Frederick Wilbraham Ford of Marrawah gifted this land for the purposes of erecting a church building as a memorial to those residents of Marrwah who lost their lives in the Great War 1914 - 1918. 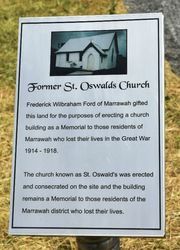 The church known as St Oswalds was erected and consecrated on the site and the building remains a memorial to those residents of the Marrawah district who lost their lives.